This amazing example of Russian lacquer miniature painting was created by a talented artist Kostrova A. from the village of Palekh and found at Russian Treasure store. The lacquer box, featuring the most striking scene from a very famous Russian tale “The Tale of Golden Cockerel” composed by the genius A. Pushkin, is a fine example of this traditional art form. 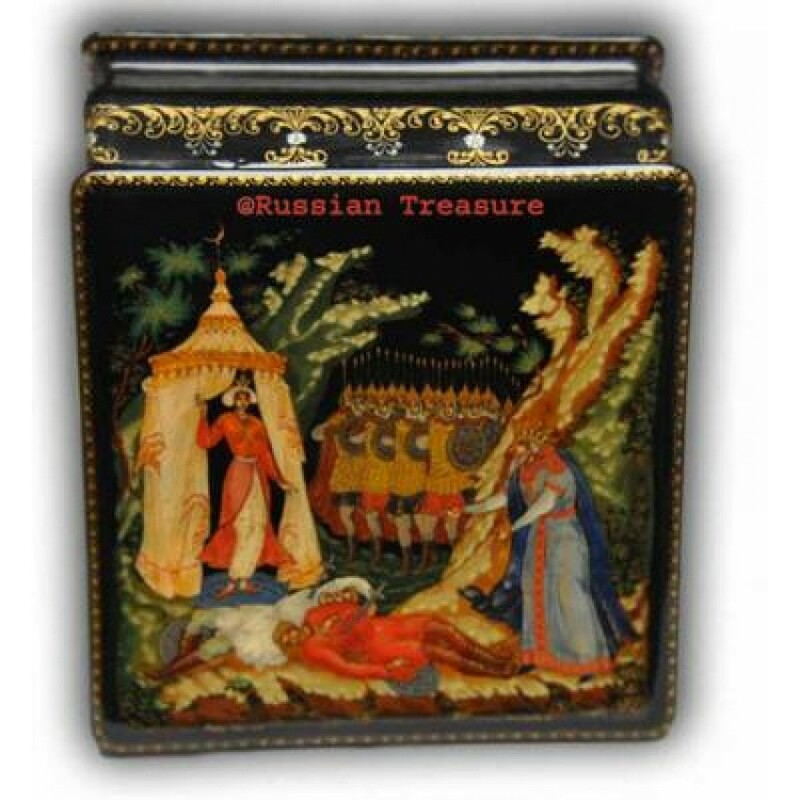 The lacquer box portrays Tsar Dadon, who came to the battle field to discover his two sons dead, killed with the sword, and their armies perished. Woebegone, Tsar Dadon started to weep, asking for his death to come for him when suddenly a lady of unearthly beauty appeared out of the tent, her name was Queen of Shamakha. The artist managed to convey every emotion and impression produced by the scene using exceptionally bright paints over the raven black background. The lacquer box is a credit to the author’s artfulness in producing the fine detail and a lyric smoothness of the lines. The elongated graceful figures of the fairy characters reflected on the lacquer box are typical of the traditional Palekh style, while the thinness of the paint applied means the true quality of the miniature. The elaborate gold ornament, laid in fine lines throughout the painting, with the intricate foliage pattern completed with aureate and silver flowers, adds to the luxurious flare of the lacquer box. The unique luster is achieved by means of several hand-varnishing of the lacquer box before the desired effect is secured. Resting on a flat bottom with a hinge on its side, the lacquer box also boasts a unique interior, polished to perfection with red lacquer. If you truly wish to impress your most special person with a singular gift, present him or her with this unparalleled lacquer box that will serve as a life-long memory of your love and care. Signed by the author with her name, the place and year of manufacture, the lacquer box is 100% original and authentic.